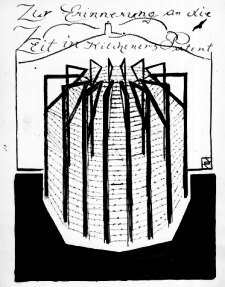 Zur freundlichen Erinnerung an die Deutsch-Evangelische Kirchengemeinde des Aliens' Detention Camp Knockaloe - Peel auf der "Isle of Man", 1915-1916. 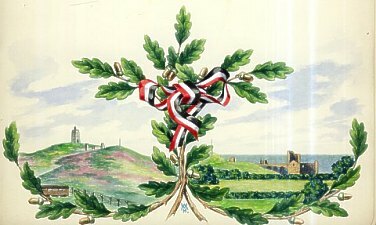 Translated Title - In friendly remembrance of the German-Protestant Church Community in the Aliens' Detention Camp at Knockaloe, Peel, on the Isle of Man, 1915-1916 - the illustration showing the German national oak-tree emblem, entwined with a ribbon in the Imperial German colours, red-white-black, in the shape of a tied bow is by William M. Hentschel. Wie tausend um ihn fallen, steht. Man uns hier zu ertragen hieß. Sie ihm mög' helfen durch die Nacht! As thousands around him fall. Also in the man who would be home. They bade us suffer here. Planted in him by his mother's words. Or sometimes amusing - the numbers are presumably their Knockaloe Camp numbers.